Washington D.C. – A spreading coalition of American based grassroots and human rights organizations who focus on the Great Lakes Region of Africa has congratulated the U.N. on its recently leaked bombshell study of the Democratic Republic of the Congo. The coalition is frequently critical of the actions of Rwandan President Paul Kagame and has labeled this U.N. report the “straw that will break the camel’s back” and show the world Kagame’s true face. The group says it now expects President Obama to live by his July 2009 speech in Accra, Ghana, and to terminate Washington’s cozy relationship with Rwanda’s strongman. The coalition’s “last straw” characterization is significant. Countless Kagame critics have noted a wide variety of abuses by his government over the years, but never before has an international organization so thoroughly documented the war crimes, crimes against humanity and potential genocide committed by Kagame’s troops in the Congo. These heinous crimes have been known for years, but the new spotlight, coming so soon after the recent false elections won by Kagame, show that the international community is now clearly focused on his autocratic regime. The critics’ allegations make a very long chronological list: It begins as far back as 1979, with the charge that Kagame aided and abetted Ugandan rebel leader, and now President, Yoweri Museveni, to plunge Uganda back into an atrocities-ridden bush war during the early 1980s – all because Museveni lost the 1979 presidential election to Milton Obote. 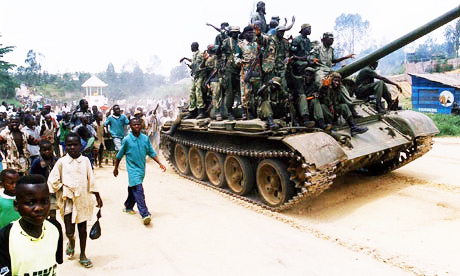 Subsequent allegations include that Kagame and other Tutsi exiles next used Museveni’s troops to invade Rwanda in a civil war that lasted from 1990-1994, when, despite his current deification as the savior who ended the genocide, Kagame also committed war crimes in that conflict. However, the list’s greatest shame is Kagame’s depredations inside the Congo. In 1996 he invaded to achieve two goals: hunt down Hutus and topple Zairian dictator Mobutu Sese Seko, replacing him with rebel leader Laurent Kabila. Plunder of the Congo’s rich mineral resources is also alleged as a Kagame crime. Rene Lemarchand has concluded that “continued access to the Congo’s economic wealth” is the real motive why Kagame continues to wage direct and proxy war inside the Congo. Supporting evidence of plunder has come not just from globally-respected experts such as Thomas Turner, but also from the U.N. and the South African Institute for Security Studies. Belying its innocuous title, “Democratic Republic of the Congo, 1993-2003,” the 545-page U.N. report uncovers shocking atrocities and war crimes. The report infuriated Rwanda even before its official release. On Thursday, Aug. 27, the draft was leaked to French newspaper Le Monde and to The New York Times. This preemptive action was taken by anonymous U.N. bureaucrats who fear that U.N. Secretary-General Ban Ki-moon and other high-ups were moving to water down the damning findings to keep Mr. Kagame happy. While it does finger others, the study’s most incendiary charges pertain to Rwanda. In a nutshell, evidence uncovered at about 25 percent of 617 sites across the Eastern Congo shows that General Kagame’s troops, together with troops led by the late Laurent Kabila, relentlessly hunted down fleeing Hutu refugees across vast swaths of rain forest and then cold-bloodedly killed tens of thousands. Lining up disarmed Interahamwe, even if they were genocidaires, and then summarily executing them violates due process even in wartime. According to the U.N. report, the Kagame and Kabila forces did much worse: At several sites, troops painstakingly separated out Hutus and then methodically murdered every one – even women, children, and old men. Nor did they spare Hutus who were Congolese. Weighing their findings, the expert authors reach a damning conclusion: that the atrocities, provided they are proven in a competent court, would constitute genocide against Hutus. The inescapable implication is that President Kagame could be legally proven to be a genocidaire. It is this Kagame history that is prompting the U.S. coalition to raise expectations that President Obama must live by his own rhetoric and use the U.N. report to distance his administration from Mr. Kagame. What the U.N. report exposes is only the tip of a massive iceberg. To switch metaphors, that iceberg must become, for Obama, the straw that breaks the back of Washington’s cozy relationship with Kagame. As American voters and taxpayers, the coalition intends to make sure this happens. The coalition is believed to be relying on two weapons: exposing the truth and forcing American leaders to show where they stand. The first strategy aims to show the world that the dominant narrative of the 1994 Rwanda genocide – that Gen. Kagame is the pristine, disciplined liberator who ended the horror and has since been building a clean, prosperous, reconciled African nation – is riddled with big falsehoods. The activists’ second strategy is ask probing questions of American officials. This will likely include current U.N. Ambassador Susan Rice. As Bill Clinton’s assistant secretary of state, Rice ran Africa policy and had crucial dealings with Gen. Kagame. The coalition asks: How can America continue to support a leader who is clearly not democratic and who is now officially an alleged war criminal and potentially a genocidaire? And why, since 2000, has Washington given Mr. Kagame more than a billion dollars of U.S. taxpayers’ money? Will this distribution from American citizens continue? As soon as the report was leaked, Kagame threatened to remove all of Rwanda’s international peacekeepers. Observers say this would have the greatest impact in Darfur, where a Rwandan officer heads the peacekeeping troops that include a large Rwandan contingent. Significantly, Sudan holds a crucial separation referendum early next year. 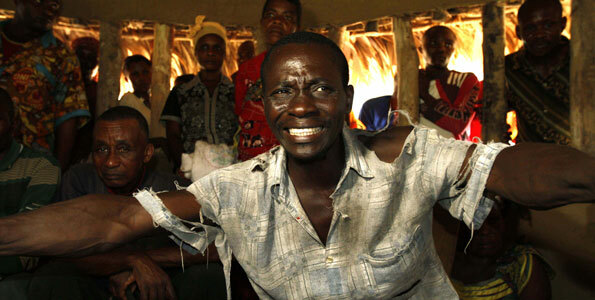 Rwanda’s threat sent U.N. leaders scrambling. U.N. High Commissioner for Human Rights Navi Pillay delayed the official issuing of the report till Oct. 1, saying that she was giving a chance to Rwanda and other implicated parties to comment on the report. Clearly the U.N. still has a long way to go on reform when it comes to impunity and accountability. Last month, after the same coalition dismissed Kagame’s reelection as a sham, the White House issued a statement two weeks later. It criticized Kagame’s pre-election repression, saying it only undermines Rwanda’s progress. Pointedly, the statement refused to congratulate Kagame. Observers are watching closely to see how events unfold at the U.N. and in Washington this time. For more information, contact Kitty Kurth of the Hotel Rwanda Rusesabagina Foundation at (312) 617-7288 or kitty@kurthlampe.com. Weighing their findings, thtroops (typo) painstakingly separated out Hutus and then methodically murdered every one – even women, children, and old men. Nor did they spare (missing text) Hute (typo) expert authors reach a damning conclusion…"
I think the international community should also investigate the wiping of Hutu community as a whole inside Rwanda. This is because before Kagame went to Congo, he had already killed several thousands of Hutu inside Rwanda until to a point he wanted to kill all Hutu in Congo. I think very much the human rights activists who did their job to have this report published. In general Hutu community is not allowed to have a representative while Tutsi have representative inside and outside Rwanda. For example all Rwandese officials work for Tutsi or RPF, kagame party in country where Hutu were 85% in the past. With so many killings, massacres, imprisonment of Hutu male in reproduction age, I don’t think Hutu community is still 85%, may be 60%. 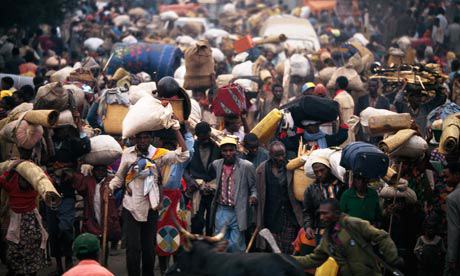 The plan to exterminate HUTU is there and it is still going on unless the international community acts NOW. Actually i thing even Hutus who massacred innocent tutsi during 1994 genocide should also be investigated, instead of using UN report as a tool to bring down Kagame. Even those who committed 1994 genocide atrocities should be brought to books!!!! Yes all who are guilty should be arrested and charged. but we can only begin to act against those whom we have actionable evidence. The Arusha tribunal is trying others although it has been accused of appeasing the victors in the 1990-1994 war and genocide. The new UN report opens a window to investigate the other phase of the atrocities, specifically, immediately after the genocide and many years afterwards. Direct and indirect evidence now leads investigators to the RPF. No one should shy away from following the path that has evidence just because Kagame will call them revisionists or deniers of genocide. Before winding up the Arusha tribunal should redeem itself by indicting those in the RPF, Hutu or Tutsi responsible for high crimes, who it has shielded for close to two decades. What is the difference between Kagame and Omar Hassan al Bashir?